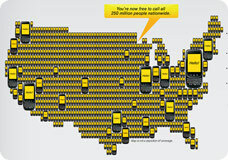 Sprint today added a new feature to its Everything Data plan package, unlimited mobile to mobile calling. With the new Any Mobile, Anytime (non-flash link), new and current Sprint customers will receive unlimited mobile-to-mobile calling from the Sprint Network to any wireless phone on any U.S. wireless carrier network at any time. This new option is even extended to existing Sprint customers who currently subscribe to an Everything Data or Everything Data Family plan, which includes nearly all the Palm Pre users in the US at this time. Sprint says you will automatically receive – at no extra charge – the added value of Any Mobile, Anytime starting on the first day of the their next bill cycle, with no action or change of plans necessary. "Simply Everything and Ready Now were Sprint innovations to make wireless simpler and more worry-free for our customers," said Dan Hesse, Sprint's CEO. "We don't think our customers want to have to keep track of or only talk to friends, colleagues or family members who make the same choices they do. Any Mobile, Anytime provides unprecedented simplicity and value, so much that many more customers can now consider cutting the cord altogether." Starting at $69.99, Sprint's Everything Data plans include unlimited text, picture and video messaging, and unlimited data services, such as e-mail, Web browsing, social networking, GPS navigation, Sprint TV, streaming music, exclusive NFL Mobile Live and NASCAR Sprint Cup Mobile applications. Existing Sprint customers who are on a different plan can take advantage of Any Mobile, Anytime by switching to an Everything Data plan without being required to renew or extend their existing service agreement. So can I tether my laptop w/out fees now? I already do and Sprint hasn't sent any cops to my door. German telecoms company Deutsche Telekom is mulling a bid for U.S. rival Sprint Nextel, Britain's Sunday Telegraph newspaper reported. The paper said Deutsche, which last week agreed a deal with France Telecom to combine their British mobile phone businesses — T-Mobile and Orange — had appointed Deutsche Bank to advise on a possible tilt at Sprint , valued at $11 billion. Deutsche Telekom slashed its full-year profit forecast in April, partly due to a weak performance in the United States. A spokesperson at Deutsche Telekom declined to comment. From a technical standpoint, I think this would be a nightmare. Suddenly, T-Mobile is handling GSM, 3G HSDPA, CDMA, and iDen. This doesn't make any technical sense. AT&T buying Cingular when both were GSM made sense. Get a new SIM card, and you doubled your network size. This is just a grab for more customers to say that your network is bigger. The end result wouldn't be a network at all - just a parent company, left to foot the bill for a next-generation wireless network. Ya like that plan pricing?